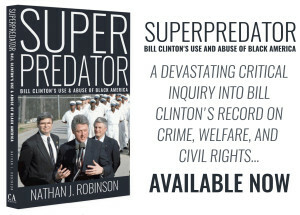 In this excerpt from Superpredator: Bill Clinton’s Use and Abuse of Black America, we examine the Clintons’ involvement in the country’s affairs during Hillary Clinton’s time at the State Department. Bill and Hillary Clinton had long shared a personal interest in Haiti, dating back to the time of their honeymoon, part of which was spent in Port-au-Prince. In his autobiography, Bill says that his understanding of God and human nature were profoundly transformed when they witnessed a voodoo ceremony in which a woman bit the head off a live chicken. Hillary Clinton says the two of them “fell in love” with Haiti and they had developed a “deep connection” to the country. So when Hillary Clinton became Secretary of State in 2009, she consciously made the redevelopment of Haiti one of her top priorities. The country, she announced, would be a laboratory where the United States could “road-test new approaches to development,” taking advantage of what she termed “the power of proximity.” She intended to “make Haiti the proving ground for her vision of American power.” Hillary Clinton selected her own chief of staff, Cheryl Mills, to run the Haiti project. As of last year Hanes had 3,200 Haitians making t-shirts for it. Paying each of them two bucks a day more would cost it about $1.6 million a year. Hanesbrands Incorporated made $211 million on $4.3 billion in sales last year, and presumably it would pass on at least some of its higher labor costs to consumers. Or better yet, Hanesbrands CEO Richard Noll could forego some of his rich compensation package. He could pay for the raises for those 3,200 t-shirt makers with just one-sixth of the $10 million in salary and bonus he raked in last year. The strategy was an odd one. Port-au-Prince had been reduced to ruin, and Haitians were crowded into filthy tent cities, where many were dying of a cholera outbreak (which had itself been caused by the negligence of the United Nations). Whatever value building new garment factories may have had as a longterm economic plan, Haitians were faced with somewhat more pressing concerns like the basic provision of shelter and medicine, as well as the clearing of the thousands of tons of rubble that filled their streets. …less than half of the reconstruction aid promised by international donors has been disbursed. And while some of that money has been put toward temporary housing, almost none of the funds have been used for rubble removal. …[a] 2011 housing expo that cost more than $2 million, including $500,000 from the Clinton Foundation, was supposed to be a model for thousands of new units but instead has resulted in little more than a few dozen abandoned model homes occupied by squatters. The most notorious post-earthquake development project, however, was the Caracol industrial park. The park was pitched as a major job creator, part of the goal of helping Haiti “build back better” than it was before. The State Department touted the prospect of 100,000 new jobs for Haitians, with Hillary Clinton promising 65,000 jobs within five years. The industrial park followed the Clintons’ preexisting development model for Haiti: public/private partnerships with a heavy emphasis on the garment industry. Even though there were still hundreds of thousands of evacuees living in tents, the project was based on “the more expansive view that, in a desperately poor country where traditional foreign aid has chronically failed, fostering economic development is as important as replacing what fell down.” Much of the planning was focused on trying to lure a South Korean clothing manufacturer to set up shop there, by plying them with U.S. taxpayer funding. The Caracol project was“the centerpiece” of the U.S.’s recovery effort. A gala celebrating its opening featured the Clintons and Sean Penn, and it was treated as the emblem of the new, “better” Haiti, that would demonstrate the country’s commitment to being “open for business.” In order to build the park, hundreds of poor farmers were evicted from their land, so that millions of dollars could be spent transforming it. Far from 100,000 jobs—or even the 60,000 promised within five years of the park’s opening— Caracol currently employs just 5,479 people full time. That comes out to roughly $55,000 in investment per job created so far; or, to put it another way, about 30 times more per job than the average [Caracol] worker makes per year. The park, built on the site of a former U.S. Marine-run slave labor camp during the 1915-1934 U.S. occupation, has the best-paved roads and manicured sidewalks in the country, but most of the land remains vacant. Even Bill’s U.N. Office of the Special Envoy couldn’t track where all of [it] went—and the truth is that still today no one really knows how much money was spent “rebuilding” Haiti. Many initial pledges never materialized. A whopping $465 million of the relief money went through the Pentagon, which spent it on deployment of U.S. troops—20,000 at the high water mark, many of whom never set foot on Haitian soil. That money included fuel for ships and planes, helicopter repairs and inscrutables such as an $18,000 contract for a jungle gym… Huge contracts were doled out to the usual array of major contractors, including a $16.7 million logistics contract whose partners included Agility Public Warehousing KSC, a Kuwaiti firm that was supposed to have been blacklisted from doing business with Washington after a 2009 indictment alleging a conspiracy to defraud the U.S. government during the Iraq War. [L]ittle remained of the grand plans to build thousands of new homes. Instead, those left homeless would be given a small, one-time rental subsidy of about $500. These subsidies, funded by a number of different aid agencies, were meant to give private companies the incentive to invest in building houses. As efforts to rebuild whole neighborhoods faltered, the rental subsidies turned Haitians into consumers, and the housing problem was handed over to the private sector. The Clintons themselves simply stopped speaking about Haiti. After the first two years, they were “nowhere to be seen” there, despite Hillary’s having promised that her commitment to Haiti would long outlast her tenure as Secretary of State. Haiti has been given little attention during Hillary Clinton’s presidential campaign, even though the Haiti project was ostensibly one of great pride for both Clintons. The widespread consensus is that the Haiti recovery was a catastrophically mismanaged disappointment. Everyone says that they’re living in worse conditions than before… When you look at the history of humanitarian relief, there’s never been a situation when such a small country has been the target of such a massive influx of money and assistance in such a short span of time… On paper, with that much money in a territory the size of Haiti, we should have witnessed miracles; there should have been results. “If anything, they appear worse off,” says Foreign Policy of Haiti’s farmers. “I really cannot understand how you could raise so much money, put a former U.S. president in charge, and get this outcome,” said one Haitian official. Indeed, the money donated and invested was extraordinary. But nobody seems to know where it has gone. But perhaps we should be more forgiving of the Clintons’ conduct during the Haitian recovery. After all, instead of doing true harm, the Clintons simply failed to do much good. And perhaps it’s better to have a luxury hotel than not to have one, better to have a few jobs than none at all. Thanks to Bill Clinton, there’s a gleaming new industrial park, albeit one operating at a fraction of its capacity. Yet it’s a mistake to measure Clinton against what would have happened if the United States had done nothing at all for Haiti. The question is what would have happened if a capable, nonfamous administrator, rather than a globetrotting narcissist, had been placed in charge. Tens of millions of dollars were donated toward the Haiti recovery by people across the world; it was an incredible outpouring of generosity. The squandering of that money on half-baked development schemes (mainly led by cronies), and the ignoring of Haitians’ own demands, mean that Clinton may have caused considerable harm through his failure. Plenty of people died in tent cities that would not have died if the world’s donations had been used effectively. Defending the Clintons’ Haiti record is an impossible endeavor, one Democrats should probably not bother attempting. As the Center for Economic and Policy Research, which has studied the recovery, noted, when it comes to the Clinton-led recovery mission, “it’s hard to say it’s been anything other than a failure.” Haitians are not delusional in their resentment of the Clintons; they have good reason to feel as if they were used for publicity, and discarded by the Clintons when they became inconvenient. None of this means that one should vote for Donald Trump for president. His tears for Haiti are those of a highly opportunistic crocodile, and his interest in the country’s wellbeing began at the precise moment that it could be used a bludgeon with which to beat his political opponent. As we have previously noted in this publication, one does not need to be convinced that Hillary Clinton is an honorable person in order to be convinced that she is the preferable candidate. It is important, however, not to maintain any illusions, not to stifle or massage the truth in the service of short-term electoral concerns. It remains simultaneously true that a Clinton presidency is our present least-worst option and that what the Clintons did to Haiti was callous, selfish, and indefensible. More on Clinton involvement in Haiti can be found in Superpredator: Bill Clinton’s Use and Abuse of Black America.